I *love* the Kre-O microchangers series. And when they came out with 4 packs of combiner/gestalt goodness? I had to rush to the nearest Toys R Us the moment there was confirmed sighting of their stock arrival. Now, I understand that there are Transformers fans out there who are rather disappointed with this series - they'd rather see more awesome bots and figures being produced by Hasbro. I am not against them, cooler bot toys would be awesome, too. But I do love me some Lego minifig-style bots. They're easy to play with and bring around and take silly pictures with! There are a total of 4 different Combiner packs so far: Decepticon Bruticus, Constructicon Devastator, Predaking, and Superion. That's 3 Decepticon gestalts versus 1 Autobot gestalt. Not fair, Hasbro! :P But whatever, I guess they went by popularity? I don't know. Notice how they only make use of 4 bots for each combiner? Yeah, kinda disappointing. Some of the missing bots from these combiners can be found separately in the other Kreon minifig waves. Of course, they don't "merge in" with their combined buddies. Inside the box are individual plastic bags containing one of the Constructicons each, an extra bag for pieces to form Devastator, the manual, and a sticker sheet. I hated that sticker sheet with a passion. My fingers are not made for putting tiny decals on tiny construction toy pieces. I don't understand why the pieces weren't just painted with them? I hate decals. Hatehatehate decals. Yes, I have fat fingers. Urgh. I mention this because some people might actually have difficulty with this. Legos *cough* have their bags individually-numbered to correspond with numbered sets of instructions in their manuals. No such things for these Kre-O Combiners. It wasn't that much of a problem for me, just something I figured should be noted. On their foreground is the extra pieces from their packs that don't get used in their bot forms. Figured I'd take a picture with Decepticon Hook, too. 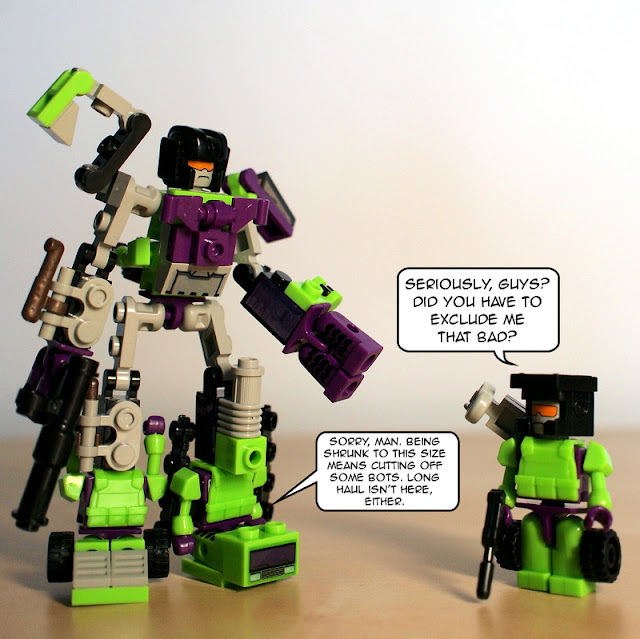 He's a solo kreon Constructicon from "Wave 1" of the Kre-O Transformers Micro Changers. I feel sorry for Mixmaster. His mixer looks "diminished". I don't even think it looks like a mixer of any sort. But hey, he's Mixmaster, aight? On the foreground are the parts not used after building him up. There's quite a few. Obviously, most of the heads are in there, some arms, wheels, etc. To build him up, you don't actually take any of the bots/altmodes and stick them together - you sort of have to take bits and pieces from various bots to build him. I kind of felt bad having to rip off one of the bots' arms to form his torso. See those 2 wheels by his lower back? Ugh. They keep falling off for me whenever I have to re-pose him and whatnot. Actually, he feels kind of fragile. I keep wanting to change his pose to get a good picture, but bits of him will keep falling off and I'm pretty sure I'm not roughing him up when I move his parts around. All in though, I think Devastator looks great! He resembles his G1 incarnation quite well as a construction toy kreon/minifig. Definitely more than the, ehem, Michael Bay version. And here's one of him "attacking" my Lego Friends café. :D I just had to! I plan on doing custom/accurate helmets for all the combiners as well as actual hands. For this guy in particular, MixMaster is getting a cement drum, and I'm thinking about adding a dump truck bed to attach to the back so it looks like LongHaul is in there. I also want to figure out a way of working Hook in there and making his left arm actually look like BoneCrusher instead of whatever that is supposed to be.. though w/out in hand it's hard to tell. I have a question for you though regarding their hands: would you be happy keeping the legs as fingers if I created a part that also granted them articulated thumbs? or would you prefer an actual robot hand (w/ articulated fingers)? I am actually in Singapore! :S And I'm really surprised some TF things show up here before US Retail. Maybe because China is nearby? No idea. gah! and here I thought I was being so clever too, seeing the "Hasbro Canada" on the back of your box! Ah well. Too clever for my own good. So Ariel Lemon is your countryman, that's very cool. I'm constantly bugging him over IMs regarding this or that when it comes to toy design.